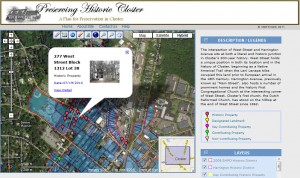 Interactive maps are a great way to preserve history. Mappler’s ability to add videos, photos, and audio to each data point allows for the website creator to illustrate a virtual walking history. Local and foreign histories can be shared with friends, family, colleagues or the community to bring awareness and unity over history. As the 21st century moves forward, the rich history of the past may becomes destroyed, forgotten, or left unheard. Volunteers can visit senior centers and interview the seniors about their lives and in turn compile their photographs and oral history onto an interactive map to be preserved and shared forever. Historic buildings and locations can be photographed and pin pointed to ensure legacies will continue even after the physical site has changed or been demolished. Art and culture are also great ways to engage communities through interactive mapping. Many communities may not even be aware of the wealth of information and locations of cultural attractions. This not only helps foster civic engagement but also increases the opportunities for tourism.